An Italian senate committee is debating whether former PM Silvio Berlusconi should be stripped of his senate seat following his conviction for tax fraud. If he loses, a possible revolt by members of his People of Freedom party (PDL) could bring about the collapse of the fragile coalition government. The senate committee could take several weeks to reach a decision. The Supreme Court upheld his conviction and ban from public office. But he will not have to serve his jail sentence. It's not just Mr Berlusconi's pride that's at stake. Being banished from elected office would leave him much more marginalised and less influential. He would be forced to try to run his political party from more of a backseat position. But as he fights to prevent all this happening, he could deploy a potentially devastating weapon. He leads a faction that is a major part of the coalition government. And some of his supporters have threatened to bring it crashing down - triggering elections - if their leader is indeed flung out of parliament. But taking that dramatic option could backfire. 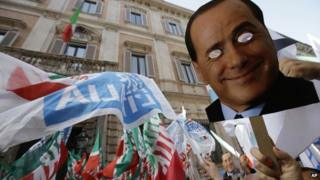 Mr Berlusconi might be widely blamed for plunging Italy into renewed political chaos. And this just at a time when some stability might help the country begin to emerge from its protracted economic crisis. The 76-year-old billionaire was found guilty of being at the centre of a vast tax fraud scheme at his Mediaset television empire, and sentenced to four years in jail (commuted to one year). A court is expected to decide in October whether Mr Berlusconi will have to serve his one-year sentence as community service or under house arrest. The senate's deliberations are based on a 2012 law that says anyone sentenced to more than two years in prison is ineligible to hold public office. Mr Berlusconi argues that he was wrongly convicted and was instead the victim of biased, politically motivated judges. He also says that the "Severino law" that would expel him cannot be applied retrospectively. His lawyers want the proceedings postponed until the European Court of Human Rights decides or Italy's constitutional court rules on whether the law is valid. They also want the European court to rule on the tax fraud conviction itself. However, Prime Minister Enrico Letta's centre-left Democratic Party (PD) has rejected the move, accusing the PDL of time-wasting.